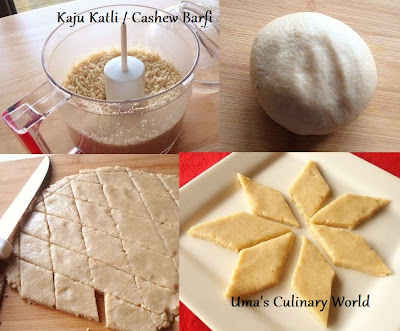 Indian Cashew Fudge popularly known as Kaju Katli or Kaju Barfi. Atleast twice a month, I prepare some sweet in my kitchen - cake or kheer or halwa. Although, I love most sweets, I prefer Barfi, Pedha or a small Ladoo where one piece after a meal satiates my sweet tooth. Raw/unroasted and unsalted cashews work best for this barfi. Grind cashews in a dry blender jar to a slightly coarse or fine powder. In a thick bottom pan, add water and sugar. Keep stirring until sugar dissolves. Add saffron strands. You can use green cardamom/elaichi powder as well. Continue cooking until sugar syrup turns sticky. Touch the sugar syrup to check if it sticks between your thumb and index finger. Also, see if a single thread forms between your fingers. Lower the heat and add cashew powder. Continue stirring at low heat, until no cashew lumps are seen. Add 1 1/2 tsp ghee and stir until the burfi mix starts leaving the edges of the pan. Turn off the heat and take a small piece of the mix and see if you can form a smooth round ball. If so, your barfi mix is ready. If not, cook it for another minute or so. Let it cool. When the burfi mix turns cold enough to handle, knead it well and form a round ball. Grease a wooden chopping board or a flat surface for rolling with 1/2 tsp ghee. Also, grease the rolling pin with ghee. Roll the ball into 1/2 cm thick even layer. Using a sharp knife, cut diamond shaped barfi pieces. Gather the edges and knead them again to a ball and repeat the same process. Traditionally, Kaju Katli is diamond shaped. But you can get creative with a cookie cutter for fun shapes. Garnish Kaju Katli with edible silver foil if you like. Enjoy fresh Kaju Katli or keep them refrigerated. Wow,they looks prefect and highly addictive. Perfectly done and looks yummy !! my favorite sweet..i always try to get a packet of this one from India..so delicious..